Mum delivered the quilt on Wednesday and AC absolutely loves it! Here she is unwrapping it ... big sigh of relief all round. AC sent us a beautiful thank you email so I think it's safe to say we definitely hit the mark with this one. Hope everyone has a lovely Christmas and we'll see what other craft projects we can all get up to in 2012! Ian showed us all the pics last night. I think we should put more up. 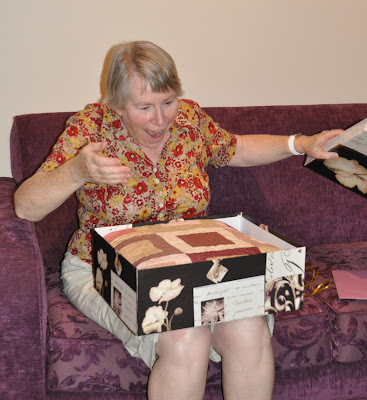 I've never seen such joy, delight and overwhelment from someone opening a present! Well get them to bring the camera tomorrow so I can!